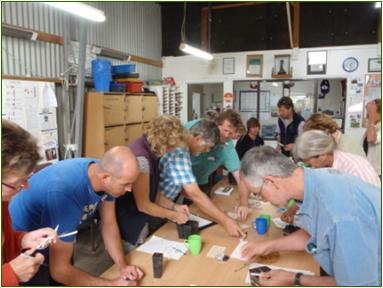 In early March 2011, Karen Walker led a Native Seed Propagation Workshop for 16 landholders from the Bega Valley and Eurobodalla Shires. Karen is the for the Far South Coast Landcare Seedbank Coordinator. Held at Riverside Nursery in Bega, the workshop started with a guided tour by Coordinator Heidi Ashburner. Participants learnt about planting mediums, pre-treating and sowing seeds, germination requirements, pricking out seedlings, using fertilisers, making cuttings, and some information on planting methods to give seedlings the best chance to thrive in a variable climate. Everyone went home with five planting tubes sown with a variety of native seeds collected from around the Valley. 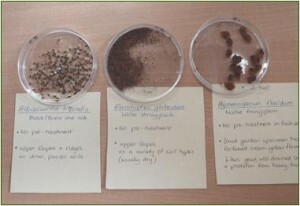 These seeds were pre-treated by Karen and included Kurrajong populneus, Acacia floribunda, Indigofera australis, Lomandra longifolia, Eucalyptus globoidea, Allocasuarina littoralis, Dianella longifolia and others. For those who missed the workshop, notes provided by Karen can be found here. Contact Karen Walker on 6491 8224 for supplies of local native seed for revegetation projects.